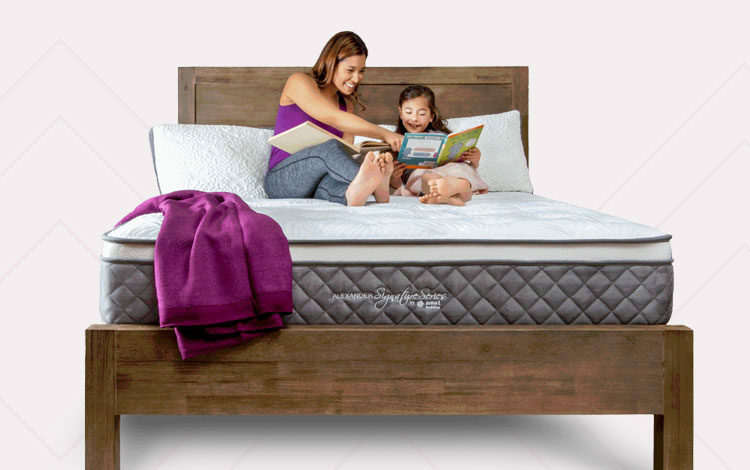 Our top mattress for combination sleepers is the Nest Alexander Signature Series memory foam mattress. This luxury memory foam mattress provides the perfect balance of pressure relief, comfort, cooling, and durability, to guarantee a comfortable night’s sleep for years. That being said, each of the options listed below is perfect for combination sleepers, it just depends on your individual preferences. Sleeping in multiple positions throughout the night can have its drawbacks: while a firm mattress may be most comfortable for sleeping on your back, if you turn onto your side in the middle of the night, you’re not going to have the cushioning you need. That’s why a mattress with a medium feel tends to be the most suitable, providing a comfortable middle-ground, no matter what position you sleep in. The Eve mattress is a medium-firm memory foam mattress, particularly popular for its durability, with many reviews agreeing that even after extensive use, it remains almost indentation-free and as comfortable and supportive as it was when buyers first got it. Although the Eve mattress leans slightly more towards the firm side, this mattress is a good pick for combination sleepers who enjoy firm support and pressure relief while asleep. The Eve mattress is a 10-inch mattress constructed from three layers and is designed to offer plenty of bounce, excellent pressure relief, motion isolation, and a cool surface, all night through. The bottom of the mattress is a 6.5-inch support base of ultra-resilient foam that adds stability to prevent sagging over time. Next up is a 1-inch thick middle layer of open-pore technology foam, designed to keep you cool throughout the night. Eve states that this layer makes their mattress up to 30 percent more breathable than other memory foam beds. Finally, the top of the Eve mattress is a 2-inch thick layer of responsive memory foam that provides contouring pressure relief and a high level of comfort. These layers are then wrapped with a polyester cover that is breathable, hypoallergenic, and soft-to-the-touch. The mattress is Oeko-Tex and CertiPUR-US certified, so, although many user reviews suggest the mattress has a strong off-gassing odour for the first few nights, you can rest assured that no harmful materials or chemicals are used in the construction of the mattress. In terms of firmness, Eve rates their mattress as a 7 on a scale of 10, with 1 being very soft and 10, very firm. This medium-firm mattress is, therefore, slightly more at the firm end of the scale, but user reviews generally agree that, though firm, the Eve mattress provides plenty of bounce and comfort. The Eve mattress should have a comfortable feel for all combination sleepers, particularly if you tend to sleep on your back or side. However, some user reviews suggest that stomach sleepers find the mattress too firm, so if you frequently sleep on your front, you may want to consider a softer mattress or getting the topper with this model. A great feature of the Eve mattress is its responsive design, bouncing back almost instantly when weight is removed from the mattress. Likewise, the Eve’s ability to withstand years of use without sagging or any developing major indentations is a major advantage to this affordable mattress: providing you with years of supported, comfortable sleep for a great price. The Eve mattress comes with a 100-night sleep trial period, allowing you to fully test the mattress before committing to it. Likewise, you get a 10-year warranty, which covers physical flaws, loss of shape, and splits or cracks in the mattress. The Eve mattress is the most affordable mattress on this list, but that doesn’t mean you sacrifice on quality for the price. This memory foam mattress scores highly for its pressure relief, cooling, durability, and motion absorption, with the only main drawback being its strong off-gassing odour when first unpacking the mattress. If you can get past that, the Eve mattress is a great, budget-friendly choice for combination sleepers. The Tomorrow Sleep Memory Foam mattress is suitable for a wide range of body types and sleep styles and is one of our top picks for a mattress for combination sleepers. This 10-inch mattress is constructed from three layers, all designed to create a cool sleep surface that offers excellent pressure relief and great motion isolation, ideal for couples sharing a bed. The Tomorrow Sleep mattress is constructed from three layers. At the bottom is a 7-inch layer of high-density base foam for durability, which is then topped with a 2-inch layer of ‘Pressure Relieving Gel Swirl Memory Foam’. This layer is designed to contour to the body and distribute your weight evenly across the mattress for excellent pressure-relief and support. Finally, the top layer is a 1-inch thick layer of cooling memory foam with an open-cell structure that allows air to circulate through the mattress and provides added comfort to its overall feel. Tomorrow Sleep mattresses are latex free and CertiPUR-US certified as being free from ozone depleters, PBDE flame retardants, heavy metals, formaldehyde, and phthalates, so you can rest assured that the mattress is good for both you and the environment. The Tomorrow Sleep Memory Foam mattress is rated as a 5 out of 10 on the mattress firmness scale, with a great balance between contouring comfort from the pressure relieving foam and support from the high-density base foam. In terms of responsiveness, as an all-foam bed, the Tomorrow Sleep mattress doesn’t have a huge amount of bounce to it. Rather, it contours to your body for a more even weight distribution and deep pressure relief – people who like the feel of memory foam will like this, but those who prefer more of a ‘sleeping-on-top’ feel may not find the Tomorrow Sleep mattress very comfortable. Offering a medium feel and support for a wide range of body types, the Tomorrow Sleep is an excellent pick for combination sleepers looking for an all-around comfortable, supportive bed, no matter what position you fall asleep in. You’ll get an impressive 365-night sleep trial period with the Tomorrow Sleep mattress, giving you a full year to test the mattress for yourself before deciding whether to return it or not. The one condition of this trial is that you need to keep the mattress for at least 30 days, to allow your body to get used to the feel of the mattress. Tomorrow Sleep also offers a 10-year limited warranty with the mattress to cover against material defects and faulty workmanship. The Tomorrow Sleep bed, price-wise, is on-par with similar memory foam mattresses and you can often get it cheaper during discount periods and sales. Altogether, this is a great mattress for all sleep positions: it helps regulate your sleep temperature, offers deep-pressure relief, and isolates motion for minimal disruption. If you’re looking for a middle-range memory foam mattress, this is a solid choice. The DreamCloud hybrid mattress is a great option for combination sleepers, offering the best of both innerspring and memory foam features. With the supportive feel of an innerspring mattress, combined with the durability and feel of memory foam, the DreamCloud hybrid mattress is designed to provide a firm, supportive surface with plenty of cushioning for all body types and sleep styles. The 15-inch DreamCloud hybrid mattress is a premium, luxury mattress and that’s really reflected in its construction. The mattress is made from eight layers of quality materials. The top layer is a True Tufted cashmere-polyester blend cover, to provide breathability and a soft feel. Under the cover is a layer of gel-infused memory foam, designed to contour to your body, while the gel helps to disperse heat for a cooler surface. Next is a layer of quilted memory foam, for a super soft, plush feel that gives the DreamCloud mattress a luxurious level of comfort. The fourth layer consists of DreamCloud’s supreme natural latex, to give the mattress added bounce and contouring. Beneath this is a layer of DreamPlush high-density supporting memory foam, which provides more contouring support to the mattress. The sixth layer is made of dense memory foam, to add support to the mattress, which will cradle your body in any sleep position. The innerspring component of the mattress is a 5-zone foam ‘Best Rest’ pocketed micro-coil compression system, designed to add total support to the entire mattress. Finally, the mattress is completed with a base layer of high-density memory foam, to add support to the mattress and help isolate motion. The mattress is CertiPUR-US certified and has the added benefit of exhibiting very little to no off-gassing odour, so you should be fine to use the mattress immediately with no unpleasant smell. 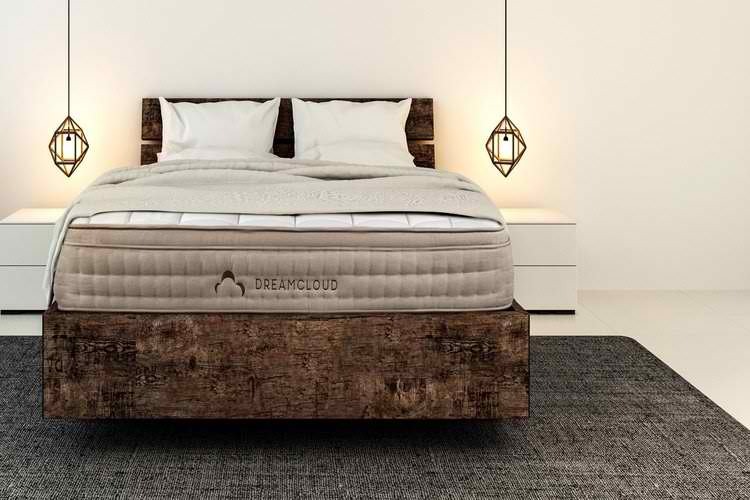 DreamCloud rate their mattress as a 6.5 out of 10 on the mattress firmness scale, describing it as ‘luxury firm’ and offering the ideal balance between ‘contouring comfort and pushback support’. For this reason, the mattress should provide an extremely comfortable surface for side, back, and stomach sleepers, as it contours to your body as you sleep. The DreamCloud mattress also performs well in terms of responsiveness, returning to shape very quickly once weight is removed from it. The mattress is therefore ideal for combination sleepers who tend to shift around throughout the night, as the foam layers won’t leave impressions for long. This mattress comes with an impressive 365-night sleep trial period and what they call an ‘Everlong Warranty’, which means they’ll guarantee the construction, materials, and quality of the DreamCloud mattress for as long as you own it. Overall, the DreamCloud mattress is a good pick regardless of your body type or preferred sleep position, which is why it’s one of our top picks for combination sleepers. This mattress combines the best features of innerspring and memory foam beds to create a soft, cushioning mattress that offers pressure relief and support – and its warranty really can’t be beaten. The Nest Alexander Signature Series mattress is a luxury memory foam mattress, available in three different firmness options, to offer a comfortable feel that all sleepers. This 12.5-inch mattress offers excellent pressure relief, uses responsive foam to add bounce, and receives great reviews for its cooling properties. This mattress is available in a medium and luxury firm option, but the luxury firm feel isn’t really suitable for combination sleepers, as it will most likely be too hard for stomach and side sleepers. For that reason, we’ve focused on the construction of the medium-feel model below. The Nest Alexander Signature Series medium mattress is constructed with four foam layers, wrapped in a half-inch thick quilted cover made from cool stretch fabric. The mattress cover includes Thermic Phase Change Cooling fabric, which is designed to keep your body cool when it’s hot and warm when it’s cold, ensuring you stay at a comfortable temperature, all night. The base layer is made of 7 inches of 1.8-lb solid edge support foam, giving the mattress a stable foundation and added durability. 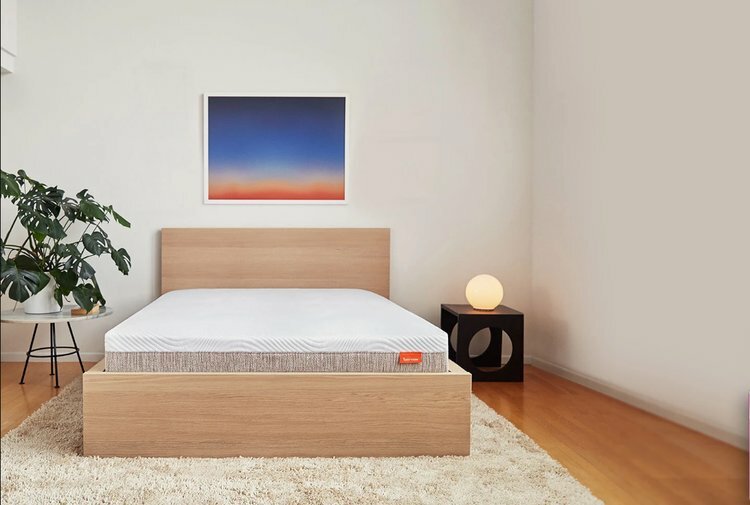 This is then topped with a 2-inch layer of 1.8-lb SmartFlow foam, which is designed to allow air to circulate through the mattress for a cooler sleep surface. The next layer is 1.5 inches of viscoelastic memory foam, to offer contouring support and deep pressure relief, which is then topped by the final 2.5-inch layer of 4-lb gel foam memory foam, for added comfort and cooling. The mattress measures 12.5-inches high, in total. The medium-feel Nest Alexander Signature Series mattress is rated as a 4.5-5 on a 10 point firmness scale, so it provides a comfortable surface that should suit all back, side, front, and combination sleepers. A great feature of this mattress is that its multiple foam layers give the mattress a bit of bounce, with the foam returning to its normal shape very quickly once weight is removed from it. If you move around a lot during the night, this mattress has a lot more responsiveness than a traditional memory foam mattress, which you might like. Nest Bedding offers a 100-night trial period for the Alexander Signature Series, so you’ve got plenty of time to decide if the mattress is right for you. You’ll also get a 10-year warranty with your purchase, which is fair – although, considering the cost of this mattress, you might expect you’d get a longer guarantee. Overall, this is a great pick for combination sleepers. 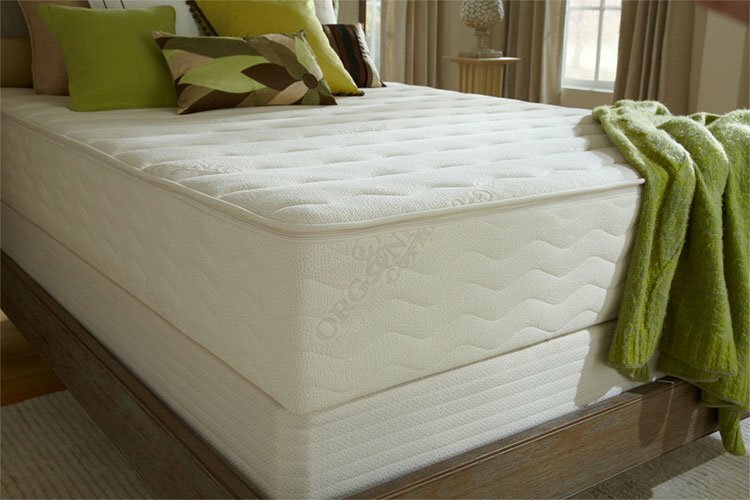 The Nest Alexander Signature Series mattress receives excellent reviews across the board: it isolates motion, which is ideal for couples and light sleepers, it offers deep pressure relief but has enough bounce so you don’t sink into the mattress, and it sleeps cool, for a comfortable, restful night’s sleep. This is a luxury mattress, so it comes with a high price tag, but, if you have the budget, you’re getting a quality product. If an all-natural mattress is at the top of your priorities, the Plushbeds Botanical Bliss latex mattress may be just the mattress for you. This organic latex mattress is available in three different thicknesses and three different levels of firmness, so you’re guaranteed to find the right model for you. The Plushbeds Botanical Bliss latex mattress is constructed from 100 percent natural, organic latex. It is available in heights of 9, 10, and 12-inches, providing options for lighter and heavier people to get the full support they need. Additionally, since latex mattresses tend to be much heavier than other mattress types, the 9-inch model offers a more lightweight alternative, with the Queen-size weighing 121 pounds, compared to 172 pounds for the 12-inch Queen-size mattress. The construction of the Plushbeds Botanical Bliss changes depending on what thickness you go with. 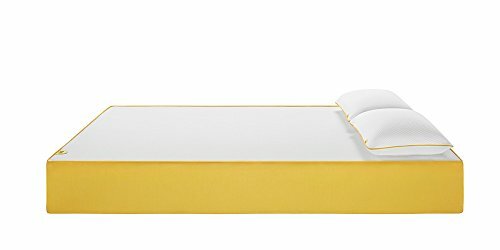 The 9-inch model is constructed from two 3-inch layers of organic Arpico Latex, with a further 2-inch layer of organic Arpico Latex, up to 10 pounds of organic wool batting, all wrapped in a 1-inch thick organic cotton cover that provides unrestricted airflow and improved moisture absorption for a cool and comfortable night’s sleep. The 10-inch model has three, 3-inch layers of the organic Arpico Latex and up to 10-lbs of organic wool batting, which are then wrapped in the same cotton cover. The 12-inch model is exactly the same as the 10-inch mattress, but with the addition of another 2-inch layer of organic latex for a higher mattress. The Plushbeds Botanical Bliss mattresses use organic wool batting, to offer both support and additional cooling. The wool cradles your body and makes for an extremely comfortable feel, but it is also naturally breathable to help your body maintain a cool temperature throughout the night. The Arpico latex used in each model is organic Dunlop latex and is manufactured to a different firmness level (medium or firm), depending on your preference. Undoubtedly, one of the biggest draws of this mattress is the natural, organic materials used in its construction. The Plushbeds Botanical Bliss mattress uses 100 percent natural GOLS-Certified Dunlop latex, GOTS-Certified organic cotton and wool, and it is also certified by eco-INSTITUT, Oeko-Tex Standard 100, Control Union, USDA, and GreenGuard, so you know you’re buying a natural mattress with the highest quality, chemical-free materials. The Plushbeds Botanical Bliss mattress is available in medium or medium-firm. The medium mattress has a medium top layer, medium-firm middle layer, and a firm bottom layer. The firm mattress, on the other hand, has medium, firm, and extra-firm layers. If you want an even firmer feel, you also have the option of unzipping the cover of your mattress and swapping the ‘medium’ top layer with the ‘medium-firm’ middle layer, to adjust the feel to suit you. Plushbeds states that their medium feel is the best fit for approximately 80 percent of their customers and it is the firmness level we’d recommend for combination sleepers, as it provides an excellent balance of luxurious comfort with contouring support. As an added bonus, Plushbeds also offers a dual comfort option with split layers in their King and Cal-King sizes, so if you and your partner have very different sleep preferences, this could be a great option for you. Latex is a great choice if you want a more responsive mattress, as it will contour softly around your body in any position – so you can still benefit from deep pressure relief while you sleep, without feeling like you’re sinking too much into the mattress. This mattress comes with a 100-night sleep trial guarantee and a lengthy 25-year limited warranty to give you peace of mind over your purchase. Overall, the one real drawback of the Plushbeds Botanical Bliss mattress is the price: but, then again, you have to expect to pay the price for such premium materials and handcrafted construction. This latex mattress is top in quality, comfort, and support, and is one of the most eco-friendly mattresses you’re likely to find on the market. If budget isn’t an issue and you know you like the feel of a latex mattress, then the medium-feel Plushbeds Botanical Bliss mattress is an excellent fit for combination sleepers looking for a quality night’s sleep, time and time again. Any of the mattresses listed above will provide a comfortable surface, whether you sleep on your front, back, side, or a mix of each throughout the night. What’s really important is that you know what type of mattress you prefer most, as a latex mattress will feel different than a memory foam mattress and a foam mattress will feel different than an innerspring mattress. Hopefully, this review has given you some ideas about the best mattress to suit your needs.